The plan was fairly simple: we would fly from our Thanksgiving visit with my family in Chicago to New York, spend a few hours exchanging our wheelie bags for our backpacks, and then head out to the airport to fly to Madrid. My daughter and I arrived in Newark in the morning and had just enough time to swap out urban holiday gear for back country hiking gear and then head to JFK. If I had it to do again, I think I might want more down time to put myself into a better “Camino is starting now” mindset, but then again, a very long plane ride can do that just as well. We’d done a good deal of research but in the end it was our instinct and not our research that saved us and got us where we wanted to go. We caught the bus directly from the Madrid airport to Pamplona, planning all the while to take a taxi to our starting point, Roncesvalles, in the Spanish Pyrenees. Everything I had read said there were no buses off-season from Pamplona to Roncesvalles, so when we got to Pamplona, we went looking for a taxi. I had budgeted a fistful of Euros and was prepared, but my very resourceful daughter thought it wouldn’t hurt to ask about buses to Roncesvalles – just in case. 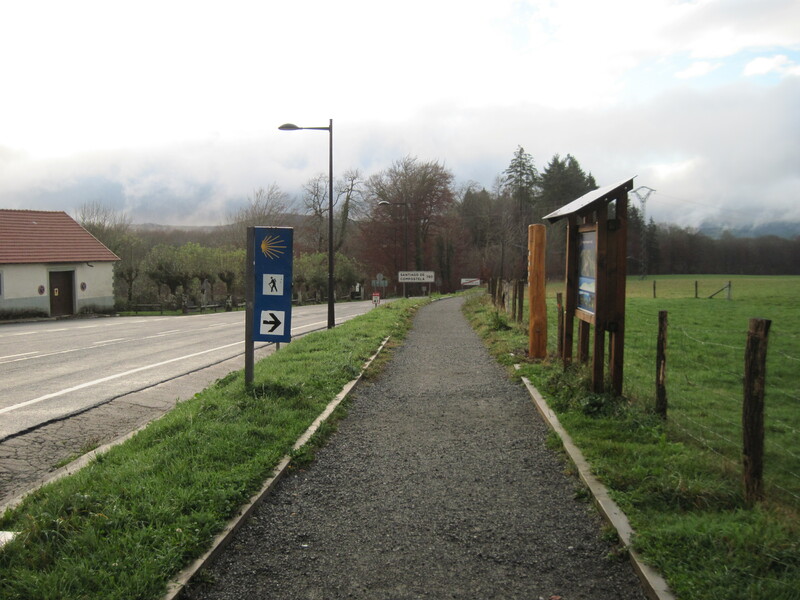 We selected Roncesvalles for a couple of reasons, the most important being that we were walking in December and that path from St. Jean Pied de Port made me nervous. Because my daughter was going to walk the full route, I didn’t want to risk a bad weather delay at the outset holding up her arrival in Santiago. What an unimaginable luxury it would be to walk the Camino on your own terms without return plane tickets or an ever-present calendar in mind. I had been to Roncesvalles in 2009 with my son, and I was looking for any excuse to go back. We checked into the same hotel I had stayed in with him and it felt like I was picking up where I had left off. The woman at the desk looked vaguely familiar. She recommended that we try the pilgrim’s menu at the local bar and we made plans to go to Mass, then dinner. Mass in the church at Roncesvalles is lovely, I’m sure, in any season, but in late November, with everyone bundled in winter clothes, it is like a haven, warmed by prayer and candles. A young woman exited just before Communion to play some music on the speakers and at the end, the priest gestured to us to come to the front of the church for a special pilgrims’ blessing. I’m guessing either our very nice front desk lady from the hotel or our bright hiking clothes tipped him off. It was beautiful and yes, we both cried. After Mass, we went over to the bar for dinner. The barman told us to sit with the other pilgrims: a serious-looking woman from Korea and two Australian guys, one of whom left early. Dinner was amazing: fish, a potato leek soup, and a cheesecake for dessert. All for 10 Euros with lovely company. And all the while we were feasting, the same young woman from the Mass music was sitting at the next table showing pictures of Roncesvalles in the snow from her laptop computer. She announced to us all that she lived in the church, had keys and knew where all the lights were, and did we want to take a tour with her as guide? I could not believe our good fortune! One of my biggest disappointments in all this walking in Spain has been how few churches are open when I walk by and how little opportunity I’d had to explore – and photograph! – these beautiful buildings. We agreed to meet up with her at the albergue. It turned out, our guide just wants to give tours of Roncesvalles to pilgrims. She took about 5 or 6 of us into the church, the crypt, the cloister, the gallery, and the chapter room and we were able to see spaces in this wonderful place that would only be available on some organized visit. 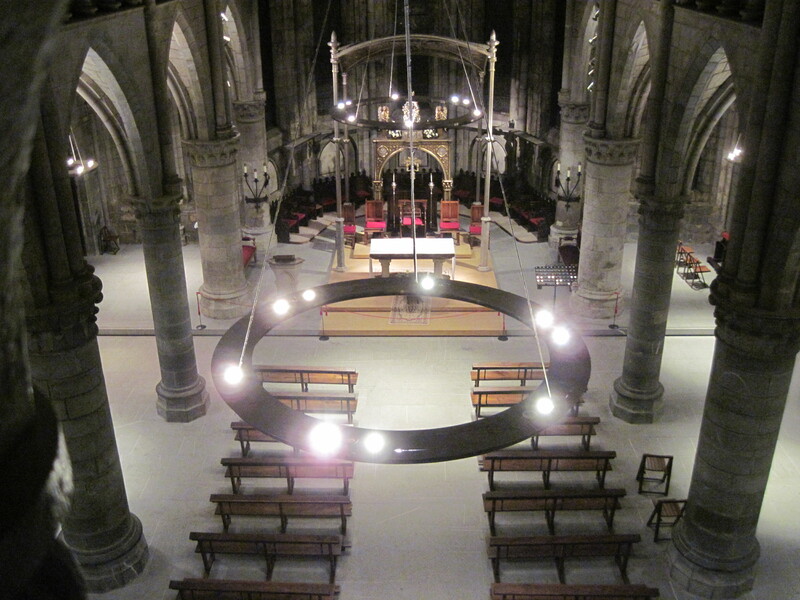 What had appeared to me as a fairly small church with not much around it, was actually a much, much larger series of buildings, the Colegiata, and all of it lies behind, around, and underneath the central church space. After our tour, she served small cups of a local liqueur. The next morning, we had a great breakfast designed for pilgrims with lots of “pocket” food, like fruit and snacks. We left to start walking and met up with our guide again on our way to the Camino where we exchanged email and Facebook information. She wished us a Buen Camino, I took a couple of photos and we started walking. It was December 1, almost sunny and gorgeous.